NASA's Mars rover Curiosity flexed its long robotic arm for the first time on the Red Planet Monday (Aug. 20), passing a critical health check with flying colors, mission managers say. The rover unfolded the robotic arm and performed an intricate series of test maneuvers to make sure the 7-foot-long (2.1-meter) appendage is in good working order. Curiosity's robotic arm has five joints and is tipped with sophisticated instruments to get up close and personal with Mars. Monday's Martian workout flexed all five joints on the robotic arm to extend it out in front of Curiosity, and then fold it back into its travel position ahead of the rover's first drive, which is also expected to occur in the next few days. "It worked just as we planned," Louise Jandura, Curiosity's sample system chief engineer at NASA's Jet Propulsion Laboratory in Pasadena, Calif., said in a statement. "From telemetry and from the images received this morning, we can confirm that the arm went to the positions we commanded it to go to." At the end of Curiosity's seven-foot arm is a turret, shaped like a cross. This turret, a hand-like structure, holds various tools that can spin through a 350-degree turning range. At the tip of the arm is the turret structure on which five devices are mounted. Two of these devices are in-situ or contact instruments known as the Alpha Particle X-ray Spectrometer (APXS) and the Mars Hand Lens Imager. The remaining three devices are associated with sample acquisition and sample preparation functions. 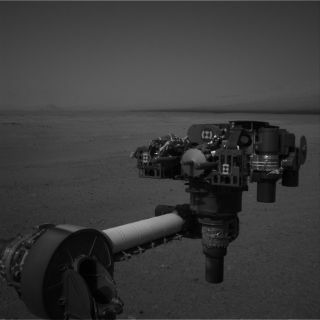 The arm's turret contains a drill that can dig 1 inch (2.5 cm) into Martian rocks, a scoop and other gear for collecting samples, a camera for microscopic analyses, and a spectrometer to determine the composition of rocket and surface targets. "We'll start using our sampling system in the weeks ahead, and we're getting ready to try our first drive later this week," said Richard Cook, NASA's deputy project manager for the Curiosity mission. But more robotic arm tests are needed before Curiosity can begin using the appendage to study Mars. The arm, mission managers said, must past several calibration checks to make sure it is working properly. "We have had to sit tight for the first two weeks since landing, while other parts of the rover were checked out, so to see the arm extended in these images is a huge moment for us," said Matt Robinson NASA's lead engineer for the robotic arm testing. "The arm is how we are going to get samples into the laboratory instruments and how we place other instruments onto surface targets." Curiosity's robotic arm is one of 10 high-tech instruments built into the car-size rover to study Mars like never before. Monday's arm checkout came one day after Curiosity shot a nearby rock with a laser built into its mast to make sure the tool worked. That tool is part of Curiosity's Chemistry and Camera (or ChemCam) instrument that determines the composition of targets by zapping them with a laser beam and then analyzing the light from the resulting sparks. The laser system, like the robotic arm, worked as expected. The $2.5 billion Mars rover Curiosity touched down on the Red Planet on Aug. 5 and is expected to spend at least two years exploring its Gale Crater landing site. The rover is designed to determine if the region could have ever supported microbial life.